So said Nicholas Burns, a veteran Foreign Service officer who held high State Department positions in the Clinton and George W. Bush administrations, in an interview with Government Executive. 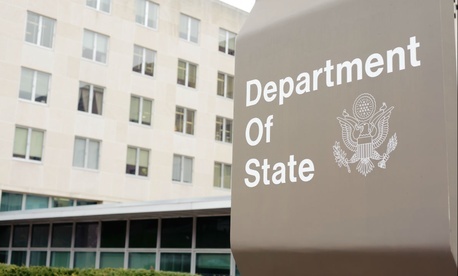 “I don’t think we’ve ever had a transition event since World War I when it was nearly April and you have no deputy secretary of State named, no undersecretaries, no assistant secretaries--the entire leadership roster is vacant,” he said. “It’s extraordinary, and it’s unfair” to Secretary Rex Tillerson, whose nomination Burns supported. Burns was in Washington on Tuesday to testify at the House Foreign Affairs Committee to protest the Trump administration’s proposed 31 percent aggregate cuts in the budgets of State and the U.S. Agency for International Development (which works out to more than the originally reported 28 percent cut for State, he said). Burns, now a professor at Harvard University’s John F. Kennedy School of Government, also bemoaned some of Trump’s “forced resignations” at State, among them Undersecretary of State for Management Patrick Kennedy and Counselor of the Department Kristie Kenney. “That was wrong to do because they were experienced people and could have helped from a management perspective,” Burns said. Morale, he said, appears to be “at its lowest point in my memory,” which goes back to his first internship there in 1980 under President Carter. “I love the State Department and am intensely loyal to the profession of diplomacy,” Burns stressed. But even with that background, Burns added, “Obviously, this is a challenging administration in which to be a Cabinet secretary. The White House is divided between those who take a more centrist establishment view and those who are, I think, radically anti-government,” among them President Trump’s chief strategist Steve Bannon. Much of the impetus for cutting State comes from Trump’s campaign pledge to focus on “America First,” which involves reducing foreign aid. Second, the “skinny budget” released earlier this month draws heavily from a longtime recommendation from the conservative Heritage Foundation. One of its foreign policy specialists, Theodore Bromund, on Monday published an op-ed arguing that the department needs both budget cuts and a culture change to get it away from “trendy” projects and better pursue U.S. interests. “It has a culture of budgetary entitlement, coupled with a lack of emphasis on rigorous, ongoing training,” Bromund wrote. “The other problem starts with the fact that State is largely divided into two sections: one that deals with regions (like East Asia) and one that deals with functions (like arms control).” Since 2005, the regional bureaus have shrunk while State has grown by about 5,000 people – in part because the “functional” bureaus have multiplied, he argued. Filling the majority of senior department positions with members of the career foreign and civil service. The one area of Tillerson’s performance Burns was willing to criticize is his handling of the press. Tillerson, as has been widely reported, has not orchestrated the traditional daily press briefings, did not take mainstream reporters on the airplane for his first major overseas trip, and did not appear personally at an event releasing the department’s annual human rights report. “We live in a democracy and it is the obligation of those of us who serve in government to be transparent with the press and the American people,” said Burns, who was the department’s chief spokesman under Secretaries Warren Christopher and Madeleine Albright. The daily briefings, which are watched online all over the world, “allow the department to broadcast its priorities, defend itself, get its message out—it’s a tremendous platform,” he said. When reporters accompany the secretary on a trip, “It gives them a much better understanding of what the administration is trying to do,” Burns added. “We will take our fair share of criticisms when we have the New York Times, CNN, the Washington Post, and the Wall Street Journal along.” But ignoring them is a “mistake tactically,” he said.